Hello everyone! 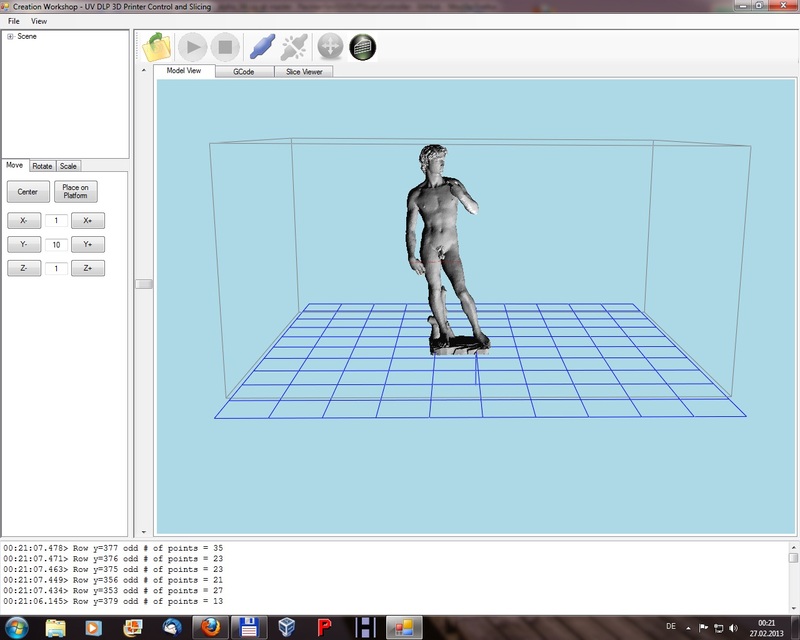 I've been working hard on some slicing and control software for my 3d DLP UV printer. It should be suitable for powder based printers as well. The software is still in alpha, but I would appreciate any feedback on features and usability. If you have a DLP UV resin printer and would like to test, please contact me. My intent is to expand my slicing and control software to work with my Prusa and Makerbot TOM in the near future. Edited 1 time(s). Last edit at 02/26/2013 06:15PM by PacManFan. ... I've tested slicing a figure -- pretty fast, but seems to have problems calculating the volume borders? See attached images - the red line in model view shows the slice position. Have you plans for support structures? I ran into that initially as well. The problem is that the model probably has holes in it. Try running it through Netfab and fix any errors. If you still have problems, then there *might be an issue with the slicing. So far, I haven't encountered any errors with valid meshes. 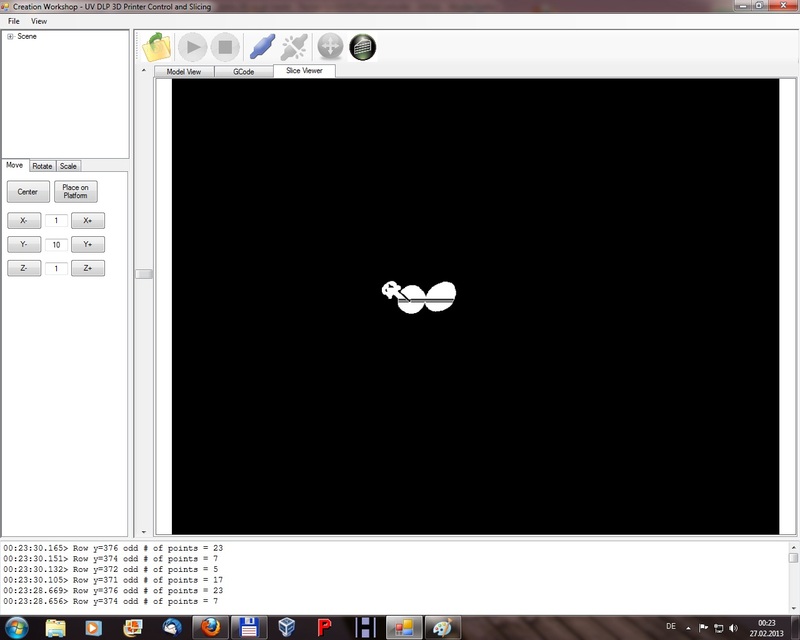 I'm adding in a system for generating support in 2d right now. Full 3d support structures will come next. Thanks for testing. i have test it,slice and gcode is ok,but can not link the arduino2560 with marlin,i have set the com,software display connect ok,but nothing send to 2560 when print,can you tell how to connect ? Make sure you're using the "Generic" driver. The "Null" driver is a local loopback device for testing only. You can verify that the firmware is connected by sending some GCode commands to it using the raw GCode display, or you can use the Up/Down buttons in the machine control display. When I download 10 Beta and 11 Beta, it gave me a html document, not the software. Version 12 is now out and supports FDM based machines as well. Come check it out and take a look at the FAQ for the hardware guide. Hello, I like very much to use Creation Workshop software with my DLP 3D printer. Recently, I want to write a program with Matlab and C++ in order to control my another 3D printer. But there is a problem I don't know how to solve about showing sliders step by step on my projector. Could you tell me how to learn about this knowledge? or give me some important keywords.